I just got hit by this tickling feeling in my stomach. It’s that feeling I get that let’s me know that right now is the moment I should be writing something. A paper, a part of my thesis, a blog post, comments. Anything really. It’s that feeling that let’s me know that my mojo is here. I like it. But for some reason, right before this feeling hits me, I always feel just “blah”. You know? Like, I can’t even come up with the simplest English words and all my brain wants to do is be lazy, work in Dutch and watch another re-run of Behind Mansion Walls on the Discovery network. Don’t you guys just love that show? Christopher Mason is awesome. Anyway. These mojo moments are rare. Sometimes they come up for two minutes, then I’m halfway through a post and suddenly it’s gone and I’m stuck again. Sometimes it stays for a full day and I write three full stories on Storylane and actually am content about them. Do you want to know something really personal? It’s probably going to be too personal, but, I strongly suspect that my mojo is actually just my hormones. Or maybe I just get inspired by something I can’t quite put my finger on. That would be a logical explanation too… Hmm… The things you wonder on a Monday evening. I also warned you that I wasn’t going to take these pants off… . Well, yes, okay, these pictures where taken on the same day at 3 meters apart and I totally just took of the yellow cardigan and threw the denim shirt on. Now you know all about my outfit photo routine. Hey, mind trying to figure out how we shot these one two three series at once? Mind breaking. I should be on a talent show. Totally referring to the Power Puff Girls in the title of this post. i love that bag, i'm a sucker for a cross body bag! hands-free! and i love this outfit! Hey, did you just go into my brain and pull out these exact thoughts? Seriously…I definitely suspect that the writing mojo is hormone- related. It is also a feeling in my stomach, and I just KNOW I can write something I will be happy with. It's a good feeling, and you never know how long it will last. Love your outfit! 🙂 And great pictures! Ugh, I totally feel you — I've been feeling totally off my game (where's my mojo?) and I think there's a pretty obvious reason why that is. But, I absolutely adore this look; those skinnies look perfect on you! that's right girl! as many jo's as it takes 🙂 although i haven't seen that show before the feeling you describe (so well) is something i'm definitely familiar with! with you on that hormone theory too – makes total sense!! you are the best. seriously my favorite. 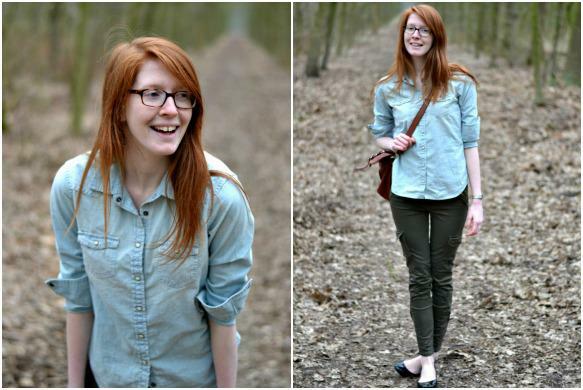 Firstly, I love the dark green and chambray combo, but I'm not sure I've ever told you how impressive I find it that you blog and do so much in a secondary language. Mojojojo! I love the Powerpuff Girls 🙂 Haha, hormones are funny things. I know exactly what you mean:-) I love your outfit! Seriously love your pants Nikki. So much that I might go and buy some myself. You look rockin'! Love those pants! wardrobe essential! 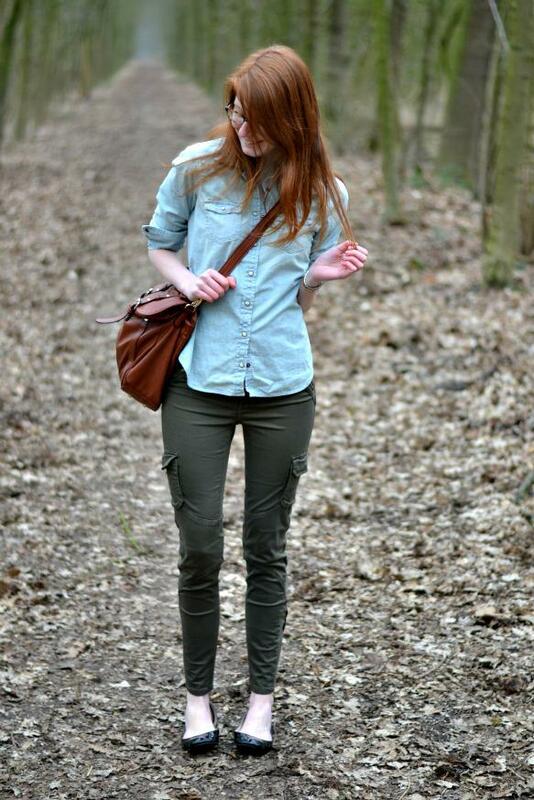 Leuke broek en mooi gecombineerd met het hemdje en de flats! Haha – this made me laugh Nikki 🙂 Glad you have your mojo for the moment, and love this cute, casual outfit. That bag is fabulous! Your outfit routine is very clever, and those cute skinnies do deserve to be worn as much as possible!